I was interested to read ‘The Voice’ online article published on 19th November 2017: ‘Parliament urged to examine reparations’ and the report back on the Global Afrikan Congress UK lobby written by Vic Motune. It would be good if your journalists researched to verify the sources of ideas and initiatives that they report on. You ought to have known that the concepts and its practical translation into campaigning for the All-Party Parliamentary Commission of Inquiry for Truth & Reparatory Justice (APPCITARJ) originated from, and have been publicly pursued by, the ‘Stop the Maangamizi!’ Campaign. 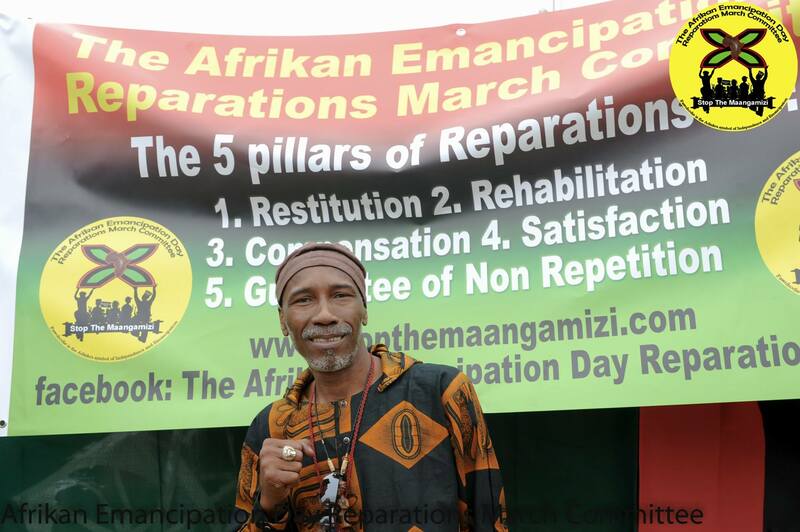 The ‘Stop the Maangamizi’ Campaign is the official campaign partner to the Afrikan Emancipation Day Reparation March Committee (AEDRMC) which organises the annual Afrikan Emancipation Day Reparations March on the 1st August each year. This is one of the main demands we have recurrently been putting before the entire British state in our annual 1st August reparations marches. Even a cursory reader of the letters that accompany the ‘Stop the Maangamizi’ Petition, which is presented each year to the UK Prime Minister at No 10 Downing Street as one of the activities of the reparations march, would know this. GACuk, which has always participated in these marches over the years, is therefore being dishonest in not acknowledging the originators of the APPCITARJ as is the ethical requirement for borrowing other people’s ideas. 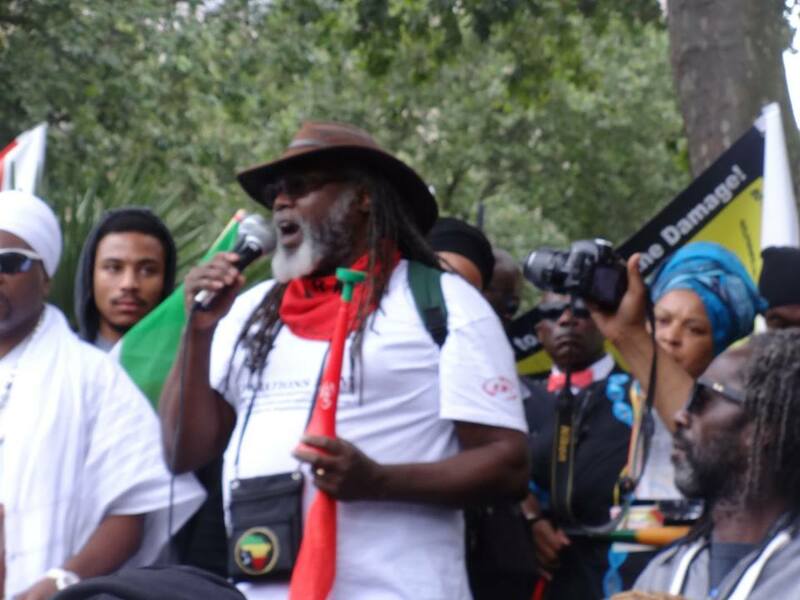 We hope your diligent research and professional media following of the activities of the International Social Movement for Afrikans (ISMAR) in the UK, which include the co-organsers and supporters of the annual reparations march and its demands, which include embracing the APPCITARJ, will be more accurately reported on in your future coverage of these matters. We recommend that you study and possibly do a write up on the report of the recent international dialogue with UK reparations activists and representatives from the National Council on Reparation in Jamaica which took place on 14th November 2017. It would be good if one of your journalists wrote about some of the recent updates in the ISMAR in the UK, or I could help by writing one; even doing so jointly with one of your journalists. We in the ‘Stop the Maangamizi!’ Campaign are very much interested in the ‘Voice’ maintaining its reputation as a credible media institution and ‘Britain’s top Black Newspaper’ and would like to contribute to making it remain so. Since originally posting these comments under the video on 14th December 2016, when the youtube link was checked yesterday 15th December 2016, the comments mysteriously became unavailable despite them being viewable for some hours when the comments were initially posted. The original comments are now available again for viewing under the you tube video. This video has been shared on many social media platforms. Since the video is publicly accessible and has been widely circulated, so must this public response be made available too. Having watched this video, it would have been better if the recording of the whole discussion on the 1st August Afrikan Emancipation Day Reparations March was posted to get a full sense of what the discussion was that proceeded the interventions from Glenroy Watson in the Q & A session (from 20 mins of the recording) in relation to the Afrikan Emancipation Day Reparations March specifically. These comments I am making are therefore in response to the discussion in the above video pertaining to the 1st Mosiah (August) Afrikan Emancipation Day Reparations March. This video recording is available for the public to view and has been circulated across many social media platforms. It is important for viewers to know that the organising of the Reparations March is part of a broader strategy that has legal, extra-legal, parliamentary, extra-parliamentary as well as community organising and mobilisation dimensions. Whilst critical discussion, dialogue and debate about the efficacy of specific strategy and tactics is part of the battle of ideas in arriving at the best way forward, I am somewhat concerned by the inadvertent impression that the conversation pertaining to the March by the speakers in the above recording cultivates. 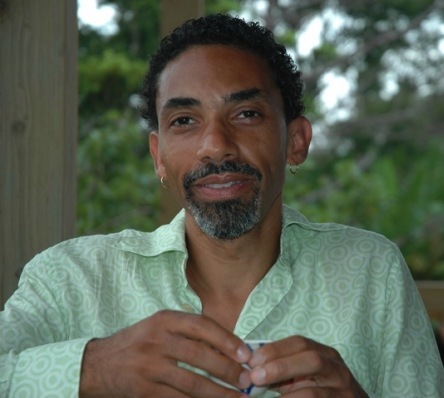 Viewers could be left with the limiting and incorrect impression that grassroots activists and leading organisers involved in developing and implementing reparations strategy and tactics pertaining to the March and its related activities, are not thinkers or strategists; lack the intelligence and cognitive wherewithal to be strategic, develop critical conceptual tools on the best methodologies for effecting and securing reparatory justice social change or fashion imaginative policies regarding implementation of what they are organising to achieve; or indeed that they are not engaged in their own creative processes of activist learning, knowledge co-production, research, critical debate and discussion or even aware of the strengths and limitations of the tactics they embark upon at particular points in our reparations-movement-building processes. Furthermore viewers are denied proper analysis of the context of ordinary people’s leadership and for a significant number, their involvement in the March organising and mobilising processes being interpreted as forms of ‘direct action from below’ that stem from the active resistance and opposition of ordinary people to the continuing impact of the Maangamizi in their lives. A further impression may also be created that the best way forward is for some elite group of ‘professionalised’ civil society experts or lobbyists who are unaccountable to Afrikan Heritage Communities, our specific Communities of Reparatory Justice Interest and our autonomous community organisations and institutions, are the ones who should be speaking, representing and negotiating for everyone else in terms of lobbying and other similar tactics etc. Furthermore, that what is required and more likely to be ‘successful’ is a more watered down, ‘liberal’ set of visions, demands and declarations Indeed, such assumptions, perspectives and views reveals some of the often obfuscated national and class politics, interests and struggles within the International Social Movement for Afrikan Reparations (ISMAR). In addition, such assumptions, perspectives and views are in danger of reinforcing the notion that ordinary people are powerless, lack agency should just be spectators in the contemporary process of emancipation from the modern-day Maangamizi, which is part of the means by which power to Afrikan people will be restored making it more likely that reparatory justice can be effected and secured. It is publicly known, and well known to Glenroy Watson, that the March has never been just about marching for a day. 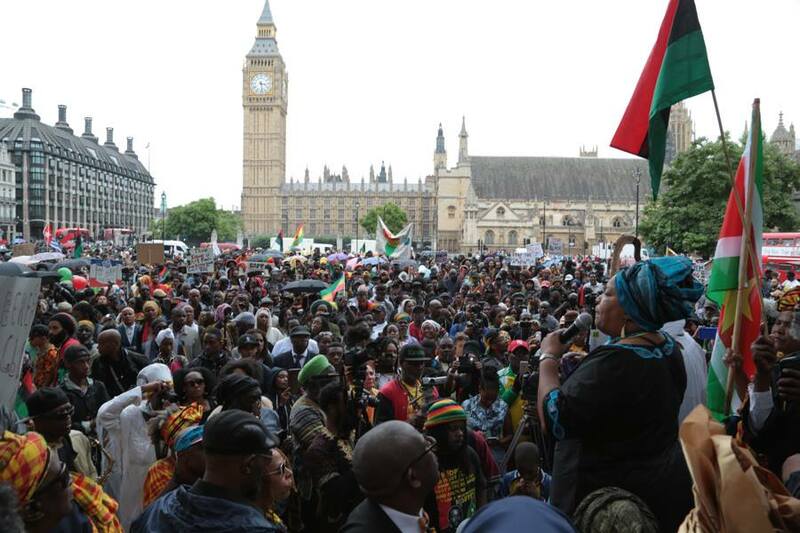 In the first year (2014) the Reparations March was also a vehicle for delivery of a reparations petition and in the second (2015) and third years (2016) of the annual March the ‘Stop the Maangamizi’ Petition got handed in to number 10 Downing Street, Office of the UK Prime Minister as part of the programme of activities of the March. 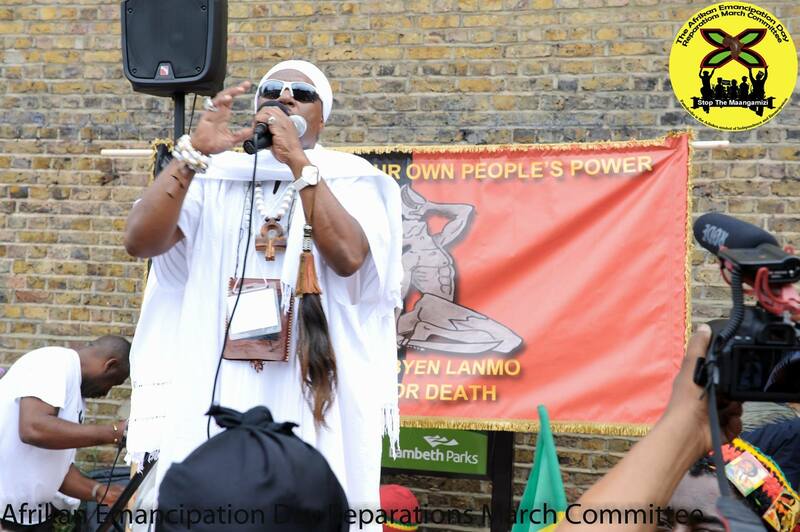 The Afrikan Emancipation Day Reparations March Committee (AEDRMC,) which Glenroy Watson knows facilitates the organising and mobilizational processes towards the annual Reparations March, are well aware that Parliament is closed on the 1st August. The 1st of August was originally chosen in the first year of the March as the day of the March because it is the officially commemorated “Emancipation Day”, marking the passing of the Slavery Abolition Act in the British Empire, on 1st August 1833. Furthermore, the significance of 1st August 1833 is that it is the date that after all the years of resistance by chattelised Afrikans, torn away from the Motherland, Britain and its fellow European enslaver-nations of Afrikan people were compelled to recognise that they could no longer continue to enslave us without severe consequences. It therefore represents a symbolic day highlighting Afrikan people’s refusal to accept enslavement, in every manner, including its present-day manifestations. In addition, it was determined that we as Afrikans and people of Afrikan heritage should March in protest at the fact that it was in the passing of the above piece of legislation; one of the most unjust passed in the recent history of Afrikan people’s resistance to the Maangamizi. Please note the full title of the act: ‘Act for the Abolition of Slavery throughout the British Colonies; for promoting the Industry of the manumitted Slaves; and for compensating the Persons hitherto entitled to the Services of such Slaves commencing on 1st August 1834’. In this act, the British Parliament legislated that enslaved Afrikans in the Caribbean would be forced to pay more than 50% of the cost of their own so-called emancipation. In 1833 the British Parliament determined that the 800,000 enslaved Afrikans in the Caribbean were deemed to be chattel and to have a market value of £47 million. This same Parliament provided the sum of £20 million in grants to our people’s enslavers which was deemed to be fair compensation to them for the loss of their so-called human chattel. This same British Parliament determined that the remaining £27 million would be paid by the enslaved people to their enslavers, by means of a 4-6 year period of unjustly extorted free labour known as ‘Apprenticeship’. It was expected that all people over six years would work for 60 hours per week as apprentices to their so-called former enslavers, 45 hours of which were extorted by their enslavers. This recording quite graciously includes the flyer with the aims of the Reparations March and any basic comprehension of the March aims makes it clear that the aims are not expected to be realised by simply marching for one day. The aims also include recognition and a profiling of Afrikan people’s varied demands, programmes and initiatives for securing reparatory justice in recognition of the diversity of strategy and tactics being deployed by various constituencies within the ISMAR. This is why the Afrikan Emancipation Day Reparations March Committee adopted 9 blocs (i.e. Ancestors, Global Afrikan Family, Community, Repatriation, Interfaith, Artists, Trade Unionists, Students, Non-Afrikan Allies) as part of the mobilising process towards the annual Reparations March and to carry on the process of contributing to and strengthening reparations social movement-building, community, mobilising and organising after and between Marches. It would not be unreasonable to expect that Glenroy Watson, (GACuk Secretary) would have also been aware of this information at the time this video was filmed on 28th November 2016 as he does mention not being at the “last evaluation meeting” (at 20 mins 30 of the recording). 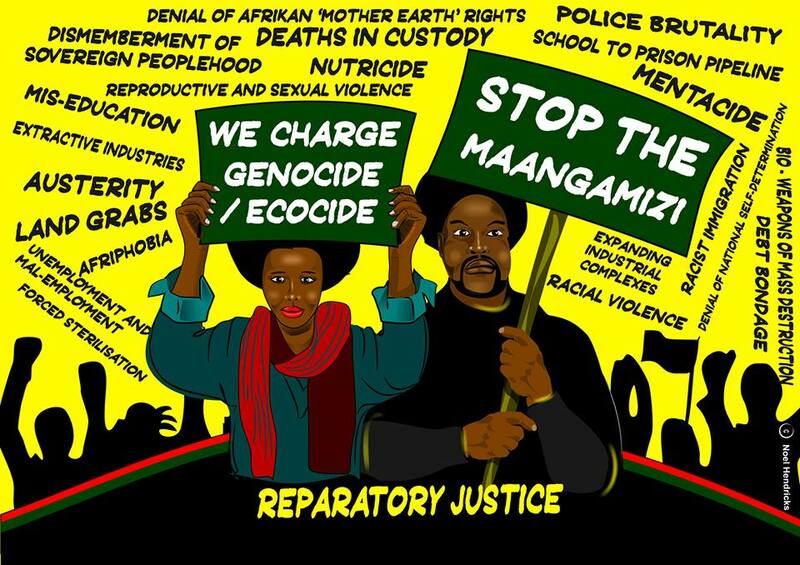 Please note for historical accuracy, one of the very public priorities of the March that the Afrikan Emancipation Day Reparations March Committee is working to is utilising the March to hand-in the’ Stop the Maangamizi: We Charge Genocide/Ecocide’ (SMWeCGE) Petition in partnership with the ‘Stop the Maangamizi’ Campaign. The SMWeCGE Petition is one of the campaigning tools of the International Social Movement for Afrikan Reparations (ISMAR) for mobilising Afrikan people’s power to exert upon the British Houses of Parliament and the European Parliament towards establishing All-Party Commissions of Inquiry for Truth & Reparatory Justice (APPCITARJs) and other actions necessary to advance the process of dialogue from the ground-upwards, with the British and other European states and society on the ‘how’ of securing Reparatory Justice. Accordingly, the annual Reparations March accompanies strategic lobbying to establish APPCITARJs at the levels of the UK and European Parliaments with various other endeavours taking place in between in different European countries. Such a goal is part of a demand being made on the British and European states to honour the need and right of the descendants of the Afrikan enslaved to speak in a public forum, provide testimony and evidence of how the legacies of enslavement are resulting in continued human and peoples’ rights violations, impaired quality of life and the ensuing destruction of the essential foundations of life for Afrikan people today. By way of emphasis, please note the SMWeCGE Petition is delivered as part of the multiple programme of activities of the March which takes place all-year round. Such information was omitted from the commentary posted on the Reparations March, if indeed it was mentioned at all by anyone who contributed to the discussion in the above video. Please read the following to find out a progress report on the activities of the March in association with the SMWeCGE Campaign and other partnerships. Please also see the lobbying tool of the SMWeCGE Campaign which is supported by the Afrikan Emancipation Day Reparations March Committee and is handed out publicly as part of the outreach being led by the Grassroots Reparations Education & Outreach Teams (GREOTs) in London and Bristol which do public mobilisation and organising work all year-round. Teams promoting the role of the Afrikan Emancipation Day Reparations March as part of the ‘street column’ of the International Social Movement for Afrikan Reparations (ISMAR). Teams being the first point of contact in the education and mobilisation of Afrikan people and the general public in relation to the March – it’s aims and intended outcomes. Teams providing the general public with information about the ‘Stop the Maangamizi Campaign (SMWeCGE), its petition, the SMWeCGE Postcard’ and the annual March, (in addition to its associated events), which takes place on 1st Mosiah (August), which is also known as Maangamizi Awareness Month. Part of the purpose of the GREOTs include: 1. Teams being action-learning exemplars of the dictum ‘Education is Preparation for Reparations’ by becoming advocates for the cause of ‘Stopping the Maangamizi’ as part of the process effecting and securing Reparatory Justice. A thorough reading, digestion and overstanding of the information contained in the above documentation will demonstrate that the March is more than a one day event and most certainly does not stand alone!!! To get a fuller perspective of the contributions being made by the March, its related activities and those of the SMWeCGE Campaign, to reparations social movement-building, it would be useful to compare and contrast these initiatives of the UK contingent of the ISMAR with other reparations related actions taking place within the UK and other countries with Afrikan Diaspora populations. It is unfortunate that no one from the Afrikan Emancipation Day Reparations March Committee, or its campaigning partner, the SMWeCGE Campaign, were invited to provide information or clarification or even answer to the critiques of the March. Such a biased discussion, being publicly circulated pertaining to the Reparations March could reasonably lead to the conclusion that there is an attempt to deny the Black/ Afrikan ‘Radical Imagination’, rationale, collective thought-processes and praxis of those engaging in tangible reparatory justice activism as part of ISMAR-building in the UK from the ground-up. People who say they are for reparations should also practice Reparatory Justice Ethics (RJE). The conversation started by Professor Maulana Karenga on reparations ethics is something we should all pay serious attention to and help develop in order to know how best to deal with each and with the issues involved in ISMAR-building. We must all endeavour to be seen to be doing true justice to our sacred cause of Afrikan reparatory justice.